While limited mobility can affect a senior’s day-to-day life, it doesn’t have to limit independence or the ability to enjoy favorite activities. When caring for seniors with mobility issues, caregivers should consider the following tips. For seniors who use mobility devices like wheelchairs and walkers, keeping the house free of clutter is essential. Make sure pathways are never impeded by clutter, unnecessary furniture, or electrical cords. A clutter-free home makes it easier for seniors to move around on their own, which preserves their independence. Older adults with limited mobility can benefit from professional in-home care. Richardson senior home care professionals can be a wonderful boon to seniors. Whether they require around-the-clock supervision or just need assistance with exercise and household tasks a few days a week, seniors can enjoy a higher quality of life with the help of trusted in-home caregivers. When seniors have mobility issues, caregivers should reorganize their belongings to optimize accessibility. Things your loved one uses every day, from the toothpaste in the bathroom to the cereal in the kitchen, should be placed in easy-to-reach locations. Consider organizing things according to your loved one’s mobility needs. Caregivers may need to help their loved ones get in and out of bed, chairs, or the bathtub. There are proper lifting techniques that should be followed to ensure you and your loved one both remain safe. While transferring your loved one, keep your head aligned with your spine, bend at your knees rather than at the waist, and avoid twisting your body. Your loved one can help by pushing him or herself to the appropriate position and putting his or her arms around your neck for added security. If you need to transfer your loved one on a daily basis, you may want to take a safety class that teaches the correct transfer form. Encourage your loved one to stay active. 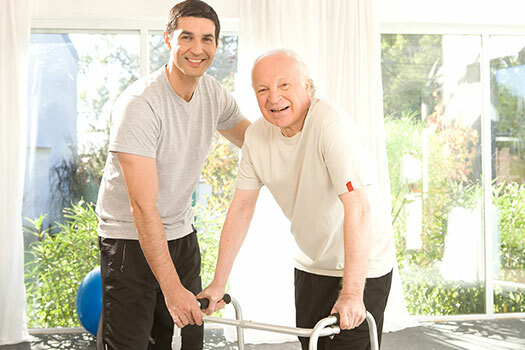 Ask doctors or physical therapists for appropriate exercises, and assist your loved one while he or she performs them. Depending on your loved one’s mobility level, he or she may be assigned easy stretches, chair activities, or brief walking exercises. Even if your loved one isn’t expected to fully recover mobility, following a doctor-prescribed exercise regimen can prevent the situation from worsening. Limited mobility is just one of the many challenges older adults are susceptible to. Seniors can face a variety of challenges as they age, many of which can be mitigated with the help of professional in-home caregivers who provide high-quality home care. Richardson families trust in Home Care Assistance to help their elderly loved ones age in place safely and comfortably. Mobility issues shouldn’t stop seniors from enjoying their free time. There are plenty of activities and hobbies that don’t require mobility, such as reading and drawing. If your loved one experiences a sudden change in mobility levels, it could affect his or her emotional health. In the event your loved one seems unusually depressed, help him or her find an appropriate emotional outlet. Some seniors find solace in meditation, while others prefer knitting. Make sure your loved one gets outside regularly. When seniors with mobility issues are cooped up inside too often, it can diminish their sense of independence. Caring for senior citizens with mobility issues can be a challenging task. Families who find it difficult to care for their aging loved ones without assistance can benefit greatly from professional respite care. Richardson, TX, family caregivers who need a break from their caregiving duties can turn to Home Care Assistance. Using our proprietary Balanced Care Method, our respite caregivers can encourage your loved one to eat well, exercise regularly, get plenty of mental and social stimulation, and focus on other lifestyle factors that promote longevity. To learn about our high-quality in-home care options, give us a call at (469) 573-4213 today.